Chase Lenfest, through his many charitable works, is committed to improving the overall quality of life for urban and inner-city residents. His primary focus has been in the Hunting Park and East Tioga communities of North Philadelphia. Building on nearly a decade of investing in structured and innovative enrichment and athletic programming for community youth at the Lenfest Center, Chase is working to expand his impact to develop and implement a “place-based” community change strategy. Chase is a founder and active volunteer of the The Lenfest Center, a safe, positive place for youth and families in Hunting Park. Chase’s place-based mission began in 2008 with his building of the Lenfest Center. Through academic, athletic, and enrichment programming and community partnerships, the Center fosters the educational, physical, and social-emotional health of school-aged youth and their families in Hunting Park, thereby supporting current and future generations to thrive and live happy, healthy lives. He is excited to expand upon the many good works of the Center through partnerships with other Hunting Park stakeholders to move further towards fulfilling his overall mission. The Lenfest Center strives to offer a variety of educational, athletic and life-skills opportunities for children in grades K-12. By offering structured and innovative education, athletic and enrichment programming, The Lenfest Center will prepare young people to be active contributors to their community. 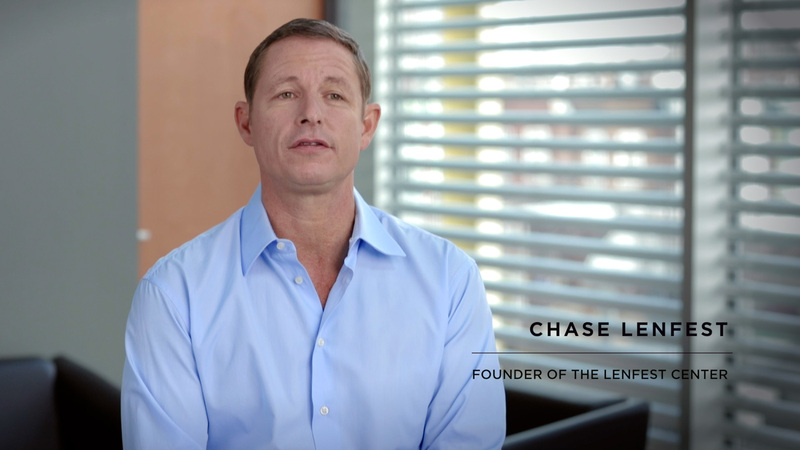 Chase Lenfest is the President of the H. Chase Lenfest Foundation, Inc. The Foundation began operations in 2002 and provides financial support for programs intended to grow his mission in the Philadelphia area. Founded in 2001, SquashSmarts is a free intensive out-of-school time program changing the lives of Philadelphia’s public school students. SquashSmarts is a 501c3 non-profit academic and athletic mentoring program with a proven track record of keeping kids in school, in shape and on track for graduation. Chase is one of Philadelphia’s foremost philanthropists and devoted squash players. Over the past two decades, he has personally taken it upon himself to volunteer with our students on a weekly basis and make a personal connections with each SquashSmarts girl and boy in the program to ensure they have a meaningful, engaging experience. In 2007, Chase turned SquashSmarts’ dreams into reality with the construction of the incredible Lenfest Center in North Philadelphia’s Hunting Park, a state-of-the-art 52,000 square foot community center built just for kids. To this day, Lenfest Center, with its 8 international squash courts, 2 learning centers and office space, serves as SquashSmarts headquarters. Each year, Chase makes countless life-changing individuals camps and summer opportunities possible for our student-athletes, including: a 16-year partnership with Philadelphia Outward Bound that enables middle and high school students to challenge themselves and their teammates through a series of one-day, five-day and fourteen-day insight courses and outdoor leadership expeditions; squash tournament entries at Berwyn Squash & Fitness and The Racquet Club of Philadelphia; and a “Day at the Shore” where Chase personally chaperones twenty of SquashSmarts newest team members for a day at Ocean City’s Boardwalk. Equally telling of Chase’s long-term commitment, dedication and investment in SquashSmarts youth, for the past 10 years (starting in 2008) Chase has devoted every Father’s Day Weekend to our girls and boys by coaching and rooting them on at the National Urban Squash Individuals Championships at Williams and Amherst College. From its origins as a soup kitchen in 1985, Face to Face has evolved into a multi-faceted organization dedicated to caring for every aspect of its clients’ well-being on an individualized, person-to-person basis. Dedicated to the health, well being and stability of its community, Face to Face meets basic human needs and reduces suffering. With hospitality, it provides a safe environment and practical tools, which enable people in Germantown to confront personal challenges, empower their lives, and fulfill their unique potential. Gesu School is an independent Catholic School (pre-K to 8th grade) in the Jesuit and IHM traditions. Both of these religious orders believe in providing academic, spiritual and social development so that each young person understands and gives full expression to his or her God-given talents and gifts. This mission is carried on within some of the most difficult economic and family circumstances imaginable in the North Philadelphia neighborhoods that are Gesu’s primary service area. Chase Lenfest has been supporting multiple programs at Gesu School for nearly two decades. The profound impact Chase has on Gesu’s children includes not only financial support through four annual Sponsor a Child scholarships and participation in Pennsylvania’s Educational Improvement Tax Credit Program, but also his active engagement in the lives and education of our students. Chase was awarded the Spirit Medal in 2017 for his loyal dedication to Gesu School. Joe Hand Promotions is the premier distributor of closed circuit pay-per-view boxing and special events in the country. Founded by Joe Hand, Sr. and his family in 1970, the company’s size and reputation has grown due in large part to the chairman’s background, passion and keen foresight about the television distribution industry. It has always been the philosophy of Joe Hand Promotions to support many causes and organizations in order to make a difference in the community. Through the years, the company has been involved with the Special Olympics, Children’s Miracle Network Telethon, and scholarship funds at various Philadelphia area high schools. NUSEA is the umbrella organization and governing body of 19 urban squash programs in the United States, and four affiliate organizations around the world. NUSEA’s mission is to support the creation, development, and improvement of urban squash and education programs. Together, NUSEA programs enroll over 2,500 students, providing year-round academic support, squash instruction, college preparation, and community service opportunities. Chase Lenfest has been a loyal and enthusiastic supporter of NUSEA and our member programs. Chase played a critical role in providing a home base for Philadelphia’s SquashSmarts, building courts and classrooms and offices in The Lenfest Center in North Philadelphia. Chase has also been a great friend to Squash Urbano Colombia, traveling frequently to Cartagena, Colombia, to provide instruction to our program participants. Chase is passionate about urban squash, and NUSEA is deeply grateful for his generosity and commitment. PAL is “Cops Helping Kids.” We aspire to be the premier youth-service organization in the city, by reducing crime, promoting character development, and improving educational outcomes. We do this by having Philadelphia Police Officers offer sports and other programs to youth in 17 centers highest crime and lowest income neighborhoods. PAL Centers are safe havens, offering a variety of programs and other events to attract, engage, and develop more than 18,000 of Philadelphia’s youth. For more than two decades, Chase Lenfest has been a supporter and advocate of the Police Athletic League of Philadelphia (PAL). Personally, and through his Foundation, Chase has invested in many of our youth development programs, including our Chess Program and its annual Citywide Tournament. In 2005, Chase received PAL’s highest honor, the PAL Award, for his unwavering commitment to serving Philadelphia’s youth, particularly those in the city’s high-crime and low-income areas. Chase continues his commitment today in his annual support of PAL Night at the Phillies and PAL Night at the Sixers. His support allows hundreds of kids and teens from PAL’s 20 centers to root for the home teams, and sometimes even to have the opportunity to meet their sports heroes. The Philadelphia Outward Bound School (POBS) changes lives through challenge and discovery. POBS serves thousands of youth from across the region each year, providing them with confidence and skills to live healthy and productive lives. Teachers and parents of students who complete single and multi-day programs say that the changes they see are profound – young people leave their Outward Bound experiences stronger, healthier and more confident in their capacity to achieve success. Outward Bound students venture out into the wilderness and challenge themselves in ways they never knew possible. All POBS’ core programs emphasize Outward Bound’s character, leadership and service Educational Framework. As students confront challenges, they discover the key to success: that we are stronger than we know and if we can be made to see and feel success when overcoming difficult circumstances and situations, we are better prepared to face tougher ones as our lives progress. Since 2004, The H. Chase Lenfest Foundation has supported and partnered with The Philadelphia Outward Bound School, allowing hundreds of students to participate in POBS’ experiential education courses. Squash Urbano is an organization that combines academic tutoring, mentoring, travel, and the sport of squash for 50 elementary and middle public school students who are enrolled year-round in the program. Squash Urbano holds squash practice, homework help sessions and English classes at a public sports facility just outside of Cartagena's Old City and is a short walk from the public school where the program's students are enrolled. Since the program was launched in Cartegena in Sept 2014 the Chase has been a great friend and supporter of the initiative at a financial and personal level. Chase visits the program at least 4 times a year and is always willing to spend time with the kids inside and outside the squash court. Chase goes way beyond our program hours, walking around the neighborhood, talking to people and learning about all the challenges that the community has to face.